Make sense? That means one side of a building can collapse while the other remains standing, thanks to the firewall. There is nothing like this in residential construction. The closest thing you’ll find in residential construction is a one-hour fire-resistance-rated wall. This is needed between townhomes and two-family dwellings, with a lot of fine print and special requirements. There are also some special requirements when a home is within 5′ of a lot line. Check out section R302 of the MN State Building Code for details. What about the wall between the house and garage? While the six-panel door shown below gets awfully thin at the panels, this is still a 20-minute fire-rated door, so there’s nothing wrong with it being used between the house and garage. 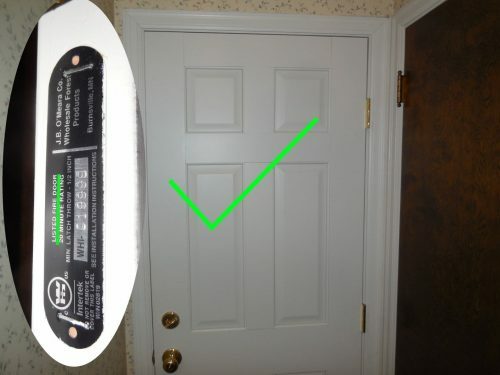 The International Residential Code (IRC) requires a self-closing device on this door, but we have no such requirement here in Minnesota. We used to, but we’ve since amended that requirement out of our code. 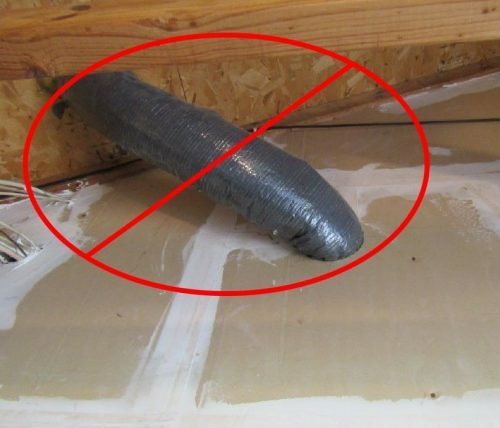 R302.5.2 Duct penetrations: Ducts running through the garage must be made of No. 26 gage sheet metal or another approved material. They also can’t open to the garage. R302.5.3 Other penetrations: Openings around vents, pipes, ducts, cables, and wires need to be sealed with a material that meets the requirements of ASTM E 136. I don’t own that standard and I don’t know what it says. From what I’ve gathered on this topic, however, small openings are supposed to be sealed with special materials, such as 3M Fire-Block Sealant. 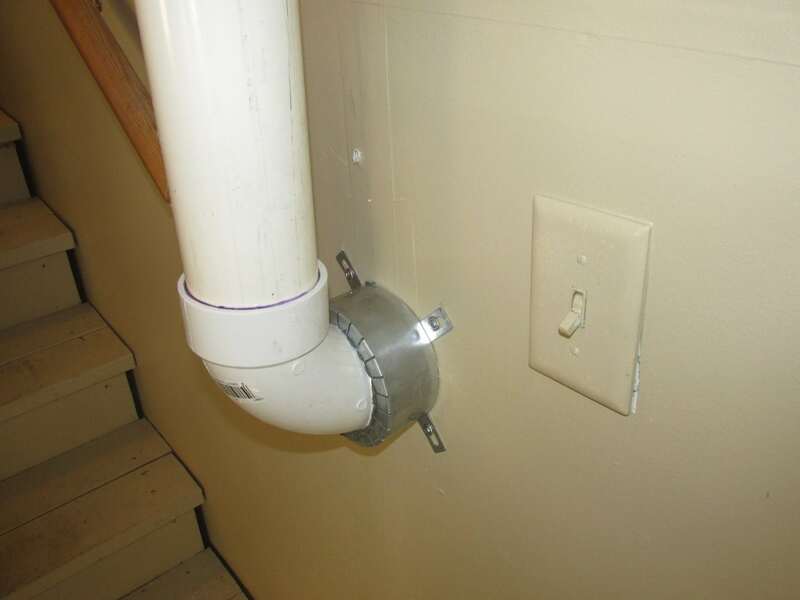 Larger openings like radon vent pipes need intumescent firestop collars, such as the one shown below. R302.6 Dwelling/garage fire separation: The wall between a house and garage must be separated by 1/2″ drywall. 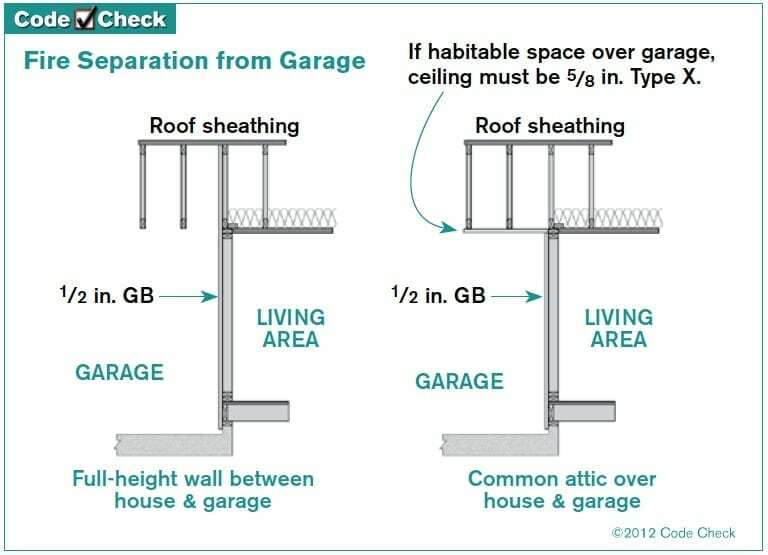 This also applies to structural members, and this extends to the attic in a common-sense type of way; the garage needs to be separated from the house. If there are habitable rooms above the garage, 5/8″ type X (fire-rated) drywall must be used at the ceiling. The image below, courtesy of the fine folks at CodeCheck, illustrates this. This is all covered under Table R306.6, which I’ve included below because there is so much info here. Structural members supporting floor/ceiling assemblies or garage ceiling used for separation required by this section Not less than 1/2-inch gypsum board or equivalent applied to the garage side of structural members supporting the floor/ceiling assemblies or garage ceiling. Structural members include, but are not limited to: walls, columns, beams, girders, and trusses. Garages located less than 3 feet from a dwelling unit on the same lot Not less than 1/2-inch gypsum board or equivalent applied to the interior side of exterior walls that are within this area. This provision does not apply to garage walls that are perpendicular to the adjacent dwelling unit wall. What’s not covered by this section is any mention of mudding and taping of joints. The building code is silent on this matter. It’s up to the Authority Having Jurisdiction to decide whether or not the joints in drywall need to be mudded and taped. In short, the garage needs to be separated from the house in case of fire, but this isn’t a fire-rated assembly, nor is it a firewall. The best term for this required separation is a fire-separation wall.